•	The School Library System (SLS) Cooperative Collection Development Plan is developed as part of the resource sharing component of the plan of service. In support of student achievement, the New York City School Library System maintains a Cooperative Collection Development (CCD) program promoting resource sharing opportunities among member libraries. The Cooperative Collection Development program is funded by the New York State Education Department. 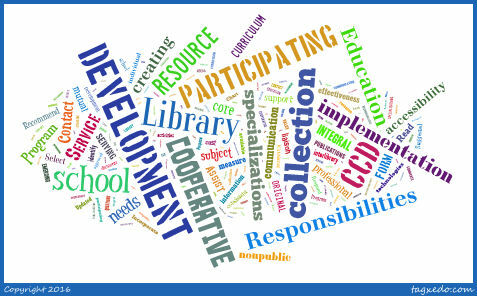 The goal of CCD is to support curricular and instructional processes of schools by promoting cooperative planning, selection, evaluation and sharing of specialized library media resources. The School Library System (SLS) Cooperative Collection Development Plan is developed as part of the resource sharing component of the plan of service. The plan is an integral approach to maximizing resources for all participating libraries. A CCD Plan allows for leveraging funding, staffing, and space in order to expand accessibility to specialized resources for all participating school libraries. The CCD Plan is developed for materials that fall outside of the core curriculum collection maintained by each school library. School Districts and nonpublic schools may opt to participate in the plan. How Do I Use a CCD Collection? Connect with the CCD librarian. Each subject guide includes contact information for the subject specialist. CCD librarians are well-versed on their topic area and can answer topic questions, help guide librarians in collection development, and serve as a resource and expert. Browse and borrow a CCD title. All CCD collections are available to search through the NYC shared catalog at https://library.nycenet.edu/. First, enter the name or number of the school library you would like to search. Then, click on the appropriate school library catalog and proceed with your search. Contact the CCD librarian to determine individual borrowing policies. Collection Development. CCD Libguides offer recommended print titles and some include eBooks accessible to New York City public and nonpublic schools. Use these recommendations to build your own collection on the subject matter.